The month of November holds a special place in the hearts of Shraddhavans. 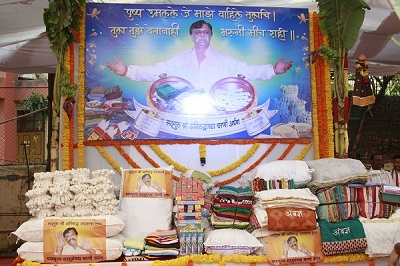 It is during this month that they celebrate the birthday of their dear Sadguru, ‘Aniruddha Pournima’ and every Shraddhavan looks forward to participate in this event each year. 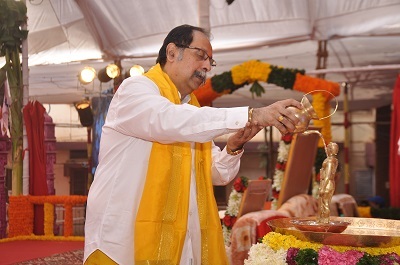 This year too Aniruddha Pournima was celebrated with great pomp and devotion. Devotees had thronged the utsav place to pay obeisance to their Sadguru for they know that it is the Sadguru who strives for their welfare and it is he who is the source of strength, building self confidence in them, equipping them to face and withstand the difficult times. Development of will power and self-confidence is of utmost importance for each and every human being. 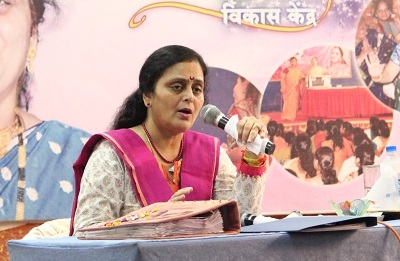 ‘Aatmabal Vikas’ classes conducted under the guidance of Dr. (Mrs.) Nanda Aniruddha Joshi is one such activity which is carried out for the development of will power and self-confidence of women. 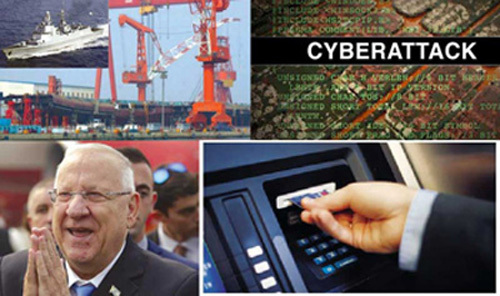 This issue highlights some of the major aspects covered during the course of this activity. Dr. (Mrs.) Nanda Aniruddha Joshi has, for the past several years, been successfully running a centre for Development of Self Confidence & Will Power (Aatmabal Vikas) for ladies. She has done her post-graduation in Biochemistry from Mumbai University and has achieved expertise and authority in Ayurveda and Naturopathy. She is also an expert in Braille and has personally taught Braille for 3 years. 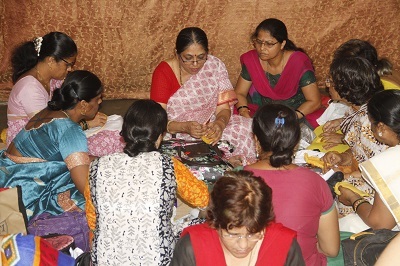 The Aatmabal classes are conducted under her guidance to develop and strengthen the will power and self-confidence of a woman, to make her bold, self-dependent and self-sufficient, thereby giving her a completely new introduction of her own self. This course spread over 6 months with a session per week, has been thoughtfully and painstakingly designed by Dr. Mrs. Nanda Aniruddha Joshi. 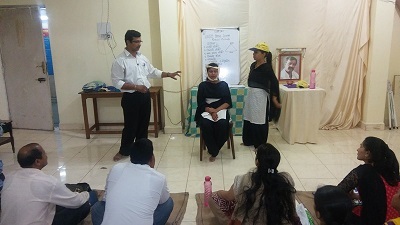 Enactments, discussions, projects and presentations specific to the theme lead the students to interact with the outside world on the one hand and get in touch with their own selves on the other. 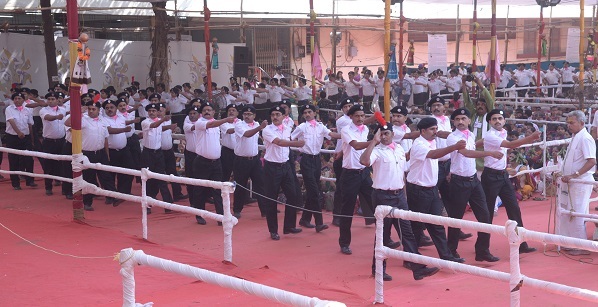 Although the basic course concept remains the same, the theme – an issue of social relevance or any significant issue, has been a new one every year. Apart from other skills, the art of Time Management for organizing and balancing work and home including multi-tasking features as a major guidance area as a streamlined lifestyle is always happy and manageable. Commonly and widely spoken, “English” is now a language of all business and formal transactions. Therefore speaking English is not just a need but an asset and fluency builds confidence in social interaction. Women who do not know English at all are taught basic communication, those who only need brushing up are given suitable opportunities. The course ends with an evening of music and presentations put up by the students in which all participate irrespective of age, profession, etc. The intention is to rid the women of stage fears or inhibitions felt owing to feelings of insufficiency. Dr. Mrs. Nanda Aniruddha Joshi personally conducts every session and is part of the designing – course delivery and material – every single year. She even directs all the presentations and skits to be staged in the end-session programme. The enrolment procedure is simple and necessitates an application. The batch is chosen based on individual personal interaction with the aspiring students. Atmabal is by no means the women’s liberation movement. Not at all. It is meant for the development and progress of the woman’s personality, for the sake of her own happiness and that of her family and dear ones. The journey of the woman’s self-exploration is set in motion and will continue for life…..beautiful at every step because she has ‘Atmabal’ behind her, with her and inside of her. 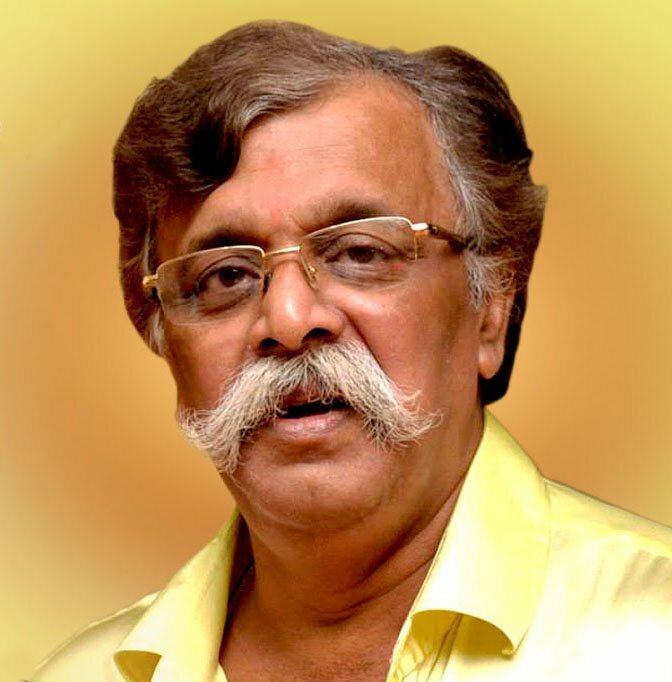 …for ‘Atmabal’ is formation of appropriate approach – towards life, towards the world and above all towards her own self. All women who experience Atmabal strike fond bonds – with themselves and with others who were with them. However long be the chain, the hand at the end is always free to hold one more. Apart from the above an Advanced Rescue Lecture was conducted by AADM for 57 DMVs who had already undergone the Basic Training course of Disaster Management. 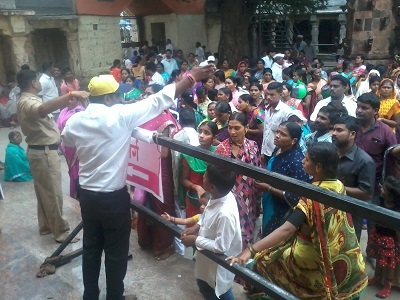 Disaster Management Volunteers of Aniruddha’s Academy of Disaster Management also participated in various sevas given hereunder wherein they assisted the local Temple trusts/ Police authorities in managing the crowd of devotees. 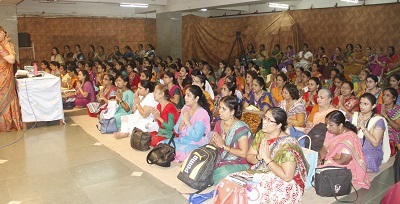 Firangai Mata Mandir, Kurkumbh on 5th, 7th and 9th October 2016Participants: 60 DMVs from 5 Upasana Centres. AADM has been providing consultancy seva to Hotel Tunga International since December 2015 at its request for effective waste disposal. To create awareness and involve the management in the project, AADM volunteers initially conducted introductory sessions on the importance of vermiculture activity to the management staff. Under the guidance of AADM volunteers, 3 vermiculture sites were constructed at Tunga International (6x3x3ft ), Tunga Paradise (5x3x3 ft), Tunga Regal (5x3x3 ft). 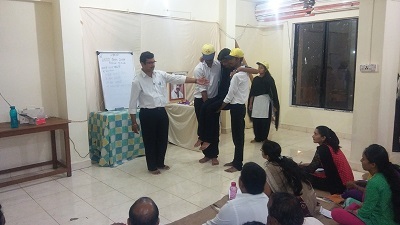 Regular training by DMVs was provided to the gardeners to handle about 25 kgs. of kitchen waste. Regular supervision is also provided on Sundays and other days by the DMVs. As on date 950 kgs. 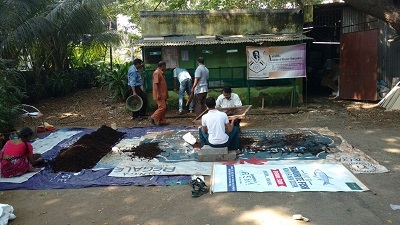 Vermicompost has been yielded from the biodegradable waste. Hotel Tunga International is keen that the Vermiculture Project should be conducted on a long term basis. 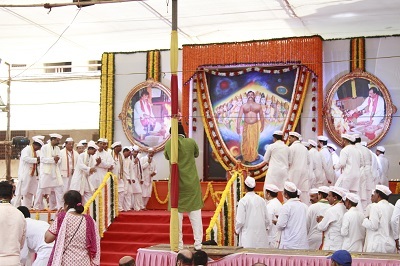 ‘Aniruddha Pournima’ was celebrated, in an atmosphere of great enthusiasm and loving devotion on 19th November 2016 at Shree Harigurugram, Bandra. 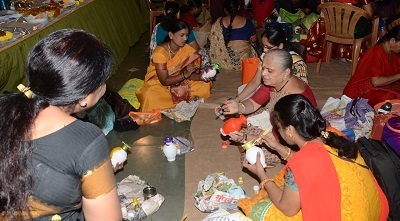 Devotees had gathered at the venue since morning and one could see the gleam in their eyes while they took part in the various events, be it the pujan of Bhagwan Kiratrudra or addressing and offering of ‘Garhane’ to their Sadguru. The ‘Garhane’ is a call, from the heart asking for blessings and support of the Sadguru at all times. 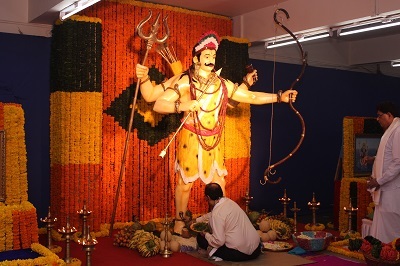 The idols of Shree Ram, Sita, Laxman and Hanumanta which are worshipped everyday in Sadguru Aniruddha Bapu’s home was also brought to the venue on this auspicious day. The abhishek (anointing) was performed on these idols as the devotees recited the Ramraksha stotra alongside. Many devotees participated in the recitation of the Ramraksha, and sat before these idols and took the darshan to their heart’s content.